Why Does Everyone Skip Visiting Taiwan? I have quickly learned that Taiwan is one of the most overlooked countries in Asia. From people I have talked with, articles I’ve read, and the fact that most backpackers that I’ve spoken with have no interest in visiting here. If it wasn’t for a friend of mine who taught English in Taiwan and told me about it, I would’ve skipped over it as well! “Taipei, Taiwan!” I replied with some excitement. The conversation above was between me and another guy at Hong Kong international airport shortly before my departure towards Taoyuan International Airport in Taiwan. It’s a good example of most other conversations I’ve had with other travelers who have visited here before. Taiwan seems to be severely ignored among current travelers and the older generation that have been here that I’ve talked to all visited roughly 10 or more years ago. Even Laos and Myanmar (Burma) are now getting more attention than Taiwan ever has it seems. Why does everyone skip visiting Taiwan? Was my interest in this island country misguided? All signs seemed to be pointing to “yes”, would this hold true now during my visit in 2016? The Republic of China, or better known as “Taiwan” should not be confused with the People’s Republic of China which is more commonly known simply as “China”. The situation between Taiwan and China is very complicated and it’s sadly been this way since 1945; while Taiwan could easily be independent as it’s a very established country, China still has control over it. Taiwan is very much its own country, but it is not recognised by the UN due to issues stated above. This has of course caused animosity with the Taiwanese people and their view of mainland China. Not a day went by during my stay where I didn’t see protestors somewhere in Taipei making their voice heard against the government of China. 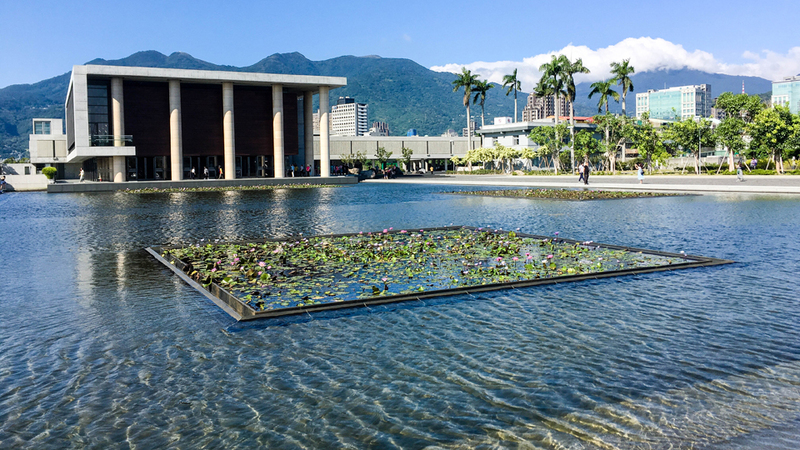 There are two airports that serve Taipei, the Taoyuan International Airport which is much bigger and a more popular choice than the Taipei Songshan Airport which is only about 5 minutes from downtown Taipei; however, Taoyuan is over an hour outside of Taipei. After arriving and getting on a shuttle bus into Taipei I had already started to plan my escape out of Taiwan. “Should I take EVA Air again or go with Korean Air?” I was asking myself before the bus even pulled away from airport arrivals as my original plan was to go to Seoul next. I had a hostel booked for 1 week, I planned on hitting the famous Taipei 101, maybe a couple other hot spots and getting out. “I must be in the best part of the city right here”, was a thought I had over and over again during my first few days. Everywhere I went felt welcoming, clean, and modern, I chalked it up to the fact that I must’ve become an expert on deciding where to go. I then went to a shopping district and caught some live music towards the end of my first week, and at this moment I started to wonder if everyone else was just simply wrong. Taiwan really is a different country in every way except the political ties to China. It has its own government, laws, currency, mannerisms, even food! While the official language may be Mandarin, roughly 70% of the population speaks Taiwanese Hokkien natively. It seems as though after the communism wave had swept China and everyone had kept their eyes on China, the Taiwanese had been secretly building their own society rather well while staying as separate as possible from China the entire time. And as an American with some knowledge of Japanese and German and absolutely none in Mandarin, getting around is fairly easy as English is a rather common language! In addition to getting around, making friends here was surprisingly easy for me as well. By the end of my first week, I had already made a few friends and even had a fun (and kinda crazy) night out! So really, why does everyone skip visiting Taiwan? What is there to do here? 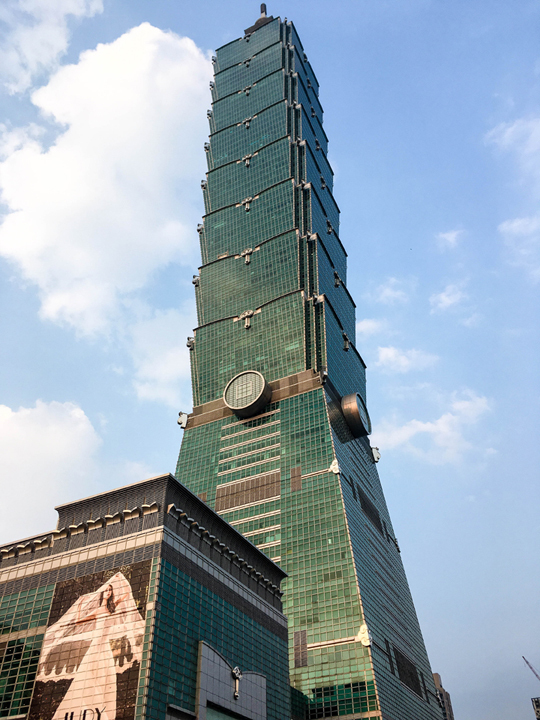 Of course one of the obvious things to check out is the famous Taipei 101 and I think this structure alone is a sign that Taiwan is more advanced than most think. Standing 1,667 ft. (508m) tall with the highest point reachable by visitors being 1,285ft. (391.8m); you can get a great view of the city below! It also features the world’s fastest elevator (as of 2016) going a shocking 37.7mph! Which means you can get from the ground to the top in 30 seconds; and yes, your ears WILL pop! It also features a whopping 728-ton tuned mass damper (TMD). So if you’re afraid of some typhoon winds during your visit, don’t worry, this massive ball-like pendulum keeps the building upright! 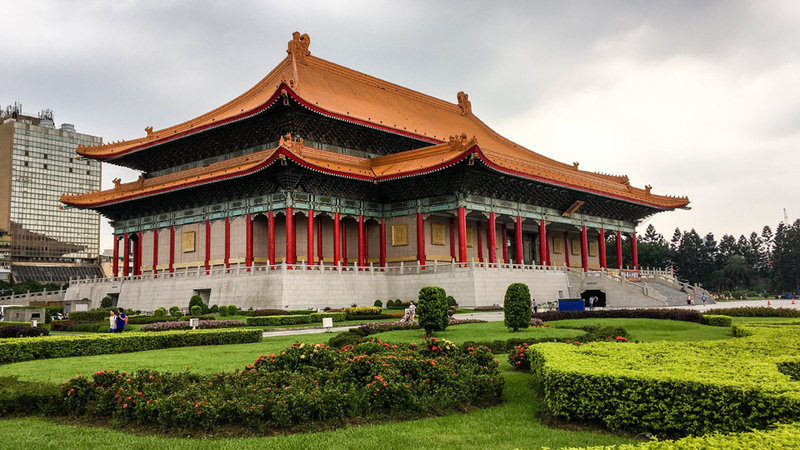 Another fun activity is checking out the changing of the guards at the Chiang Kai-shek Memorial Hall, and the entire grounds are a sight to see themselves! In addition to the main hall and the 2 other traditional style buildings here, there’s also a massive flower garden and a nice sized park as well! Are kids in tow for your adventure? Perhaps a ride on the 230 ft. (70m) tall Miramar Entertainment Park Ferris wheel! The Miramar Entertainment Park itself is more or less a very large mall with many activities, so there isn’t an entrance fee or anything like that. There’s also the excellent food of Taiwan which I will feature in a follow-up post to this one, so make sure to check back! There’s honestly so much to do just in northern Taiwan and a lot of it never gets mentioned. 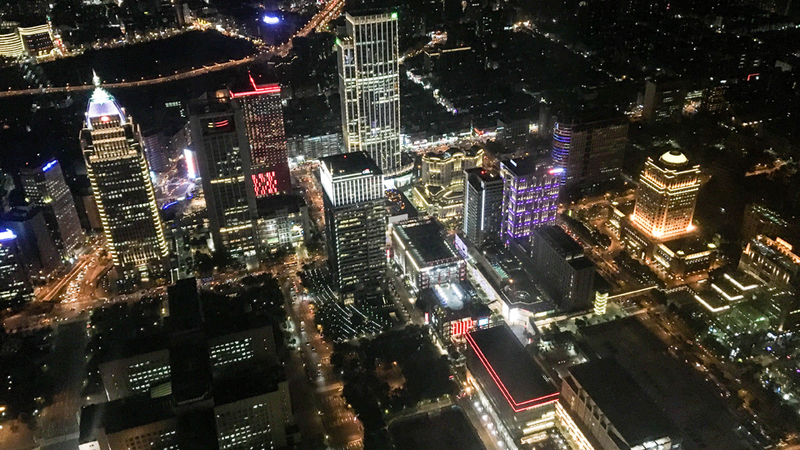 Taipei is not yet a tourist destination, so doing a search for activities here may not bring many results, but I assure you there is too many for me to mention in this one post! Countless temples, parks, memorials, a golden waterfall, and Longdong which I didn’t get to visit this time around, but doing an image search will bring up pictures of beautiful cliffsides along the ocean! Just be sure to search for “Longdong, Taiwan” otherwise, you may get unwanted results. Taiwan is without a doubt a beautiful country and much of it is best seen on foot or bike. Didn’t bring a bike with you on the plane? Don’t worry, I doubt anyone does. Rental bikes are available all over both Taipei and New Taipei City! 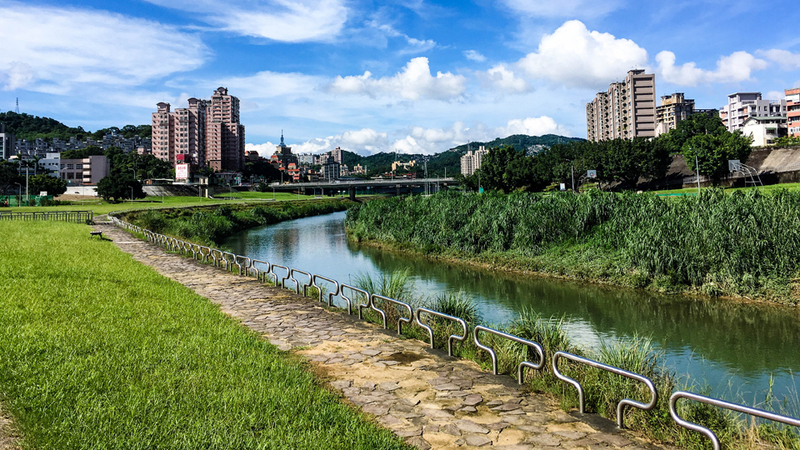 In fact, I spent an entire day riding a rental bike around different areas of northern Taiwan including along a scenic river. There are also plenty of AirBnB places to stay along with hostels and I’m sure cheap accommodations will continue to pop-up as more travelers visit here. If you have the money to spare you can always stay at the Grand Hotel Taipei which is a massive hotel that is always a treat for the eyes both inside and out! It has also had numerous famous and political figures stay as well including Richard Nixon, Ronald Reagen, Bill Clinton, Margaret Thatcher, and Nelson Mandela. There is also a small mountain behind it that gives amazing views that you have to see in person to believe! Similar to Hong Kong, Taipei is built against a backdrop of mountains which, if you have the stamina, are a great hike and also features amazing views! While some streets are a bit less desirable (but very rare), I didn’t feel threatened at any time. Crime is extremely low, so you shouldn’t have much to worry about; but as always, no place is perfect. Another great area is Tamsui; where I woke up every morning with a mountain range view out one window of my Airbnb apartment, and an ocean view out the other! I’ll cover Tamsui in my follow-up post! So, why does everyone skip visiting Taiwan? Here in 2016, I have no idea why anyone would. Sure, 10-15 years ago it may have been a rougher place. The Taipei 101 was completed in 2004 and it seems that this was the same time the country took a turn and became the amazing place it is today. It has also become one of the New Years Eve firework highlights that you’ll see on TV every year now. Thanks for reading and check back soon for a follow up on food and even more activities I did during my time here!